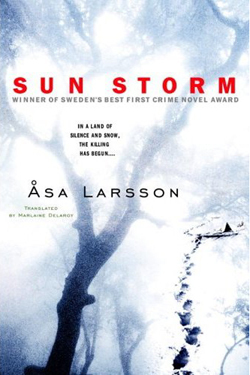 Sun Storm by Asa Larsson – If you were transfixed by the enigmatic Lisbeth Salander and undeterred by the grittiest corners of Stieg Larsson’s Sweden, consider trying this spellbinding series debut and 2003 award winner for Sweden’s Best First Crime Novel. The story begins with young Stockholm lawyer Rebecka Martinsson’s reluctant return to her small hometown after her childhood friend Viktor is found brutally murdered. A charismatic pastor known for his near-death experience, Viktor’s mutilated body is discovered before the altar of his own fundamentalist church and his troubled sister Sanna is the prime suspect in the ritualistic killing. Driven by complicated feelings of friendship and concern for Sanna’s daughters, Rebecka works to clear Sanna’s name despite having to confront dangerous religious fanatics and the personal demons that drove her from the church and town years before. Though more mainstream than Lisbeth Salander, Rebecka’s guarded nature, sharp tongue, strong convictions, and willing use of violence make her a similar force to reckon with. Above all, Sun Storm is a dark, atmospheric book of unrelenting psychological suspense that will leave you breathless up until the explosive finale. Unseen by Mari Jungstedt – If you were drawn to the Millennium Trilogy by journalist Mikael Blomkvist and his tenacious investigations into Sweden’s dark side, you might try this chilling first novel from a veteran Stockholm television reporter. Set on the vividly-rendered island of Gotland during the busy Midsummer’s tourist season, the macabre mystery begins when a woman is discovered the victim of a vicious axe murder on a secluded beach. Swedish T.V. Regional News reporter Johan Berg is immediately dispatched to cover the story, and his parallel investigation to that of the intuitive Inspector Anders Knutas soon focuses on the victim’s jealous boyfriend. When two more woman are savagely killed, however, Berg and Knutas realize they must work quickly to stop a serial killer whose seemingly random attacks have Gotland paralyzed with fear. Much like Larsson’s Blomkvist, Berg is an idealistic newsman with a knack for complicated romance made clear by his lustful affair with the married friend of the first victim. Nevertheless, the likably pesky journalist will appeal to your inner newshound in this tense, concisely-written series debut. 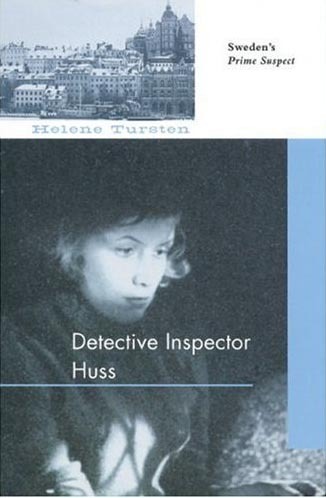 Detective Inspector Huss by Helene Tursten – If Stieg Larsson’s intricately twisting mysteries turned on your inner sleuth, but some of his books’ graphic violence turned your stomach, take a chance on this elaborate police procedural that kicks off an intriguing series favorably compared to the work of Henning Mankell. The action begins on a rain-soaked evening in the city of Goteborg just as wealthy businessman Richard von Knecht plunges from his balcony in an apparent suicide. First on the scene is Inspector Irene Huss, a Violent Crimes Unit detective, judo expert, and mother of twin teenage daughters. As the evidence begins pointing toward murder, an already sensitive investigation turns complicated and dangerous when von Knecht’s office building is leveled by a firebomb. Following a twisted trail of clues toward the surprising killers, Huss and her colleagues tangle with skinheads, dope dealers, high-priced hookers, the Hell’s Angels, and a perversely dysfunctional moneyed class in a sordid Swedish underworld painted with a much softer brush than that of the “Tattoo” Trilogy. Like Larsson’s books, however, Detective Inspector Huss features keen social insight and a rich cast of interesting characters that enhance a finely-detailed mystery you’ll be hardpressed to put down. Echoes from the Dead by Johan Theorin – For another menacing mindbender that goes lighter on the dark side, mystify yourself with this haunting cold case that mirrors the unsolved disappearance at the center of The Girl with the Dragon Tattoo. The first book in a loose-knit series set on the Swedish island of Oland, the mystery picks up with Julia Davidsson’s difficult return to Oland twenty years after her young son Jens vanished into the island fog. Alcoholic and still paralyzed by grief, Julia’s painful homecoming is at the behest of her elderly estranged father Gerlof who has ominously and anonymously received a child’s sandal in the mail. Believing that it belonged to Jens, Gerlof is emboldened in his obsessive theory that island ne’er-do-well Nils Kant was behind the disappearance and enlists Julia to help investigate. Theorin masterfully alternates between the Davidsson’s modern-day search for answers and historical episodes from Kant’s life so that when the storylines finally converge in a jaw-dropping finale the suspense is at a fever pitch. Atmospheric, intensely introspective, and ultimately hopeful, Echoes from the Dead is superior crime fiction that also explores the psychology of guilt, nostalgia, and the grieving process. Give this mystery a try and it will be no mystery why it was honored with a 2009 Dagger Award and as Sweden’s Best First Crime Novel for 2007. A Concise History of Sweden by Neil Kent – Learn more about Stieg Larsson’s homeland as well as the setting for the Millennium Trilogy in this comprehensive history of Sweden from the Stone Age to the present day. The informative and entertaining work includes coverage of the Vikings, the Scandinavian Union, Sweden’s 17th-century superpower status, the Swedish Enlightenment, the rise of Social Democracy, and Sweden’s commitment to military neutrality. Hacker Culture by Douglas Thomas – Lisabeth Salander is a brilliant computer hacker under the alias “Wasp.” Learn more about her underground hacker network in this engaging and in-depth history by USC professor Douglas Thomas. Included is an examination of hacker culture’s evolution within mainstream society, its treatment in the media including the effects of mythmaking films such as Sneakers, and a look at the legality of hacking. The Complete Guide to Asperger’s Syndrome by Tony Attwood – Based on her photographic memory and antisocial behavior, Mikael Blomkvist and others “close” to Lisabeth Salander believe she may have a form of Asperger’s Syndrome. Learn more about the condition in this comprehensive guide by a clinical psychologist and international expert on Asperger’s. Included in this readable overview are sections on diagnosis, friendship, cognitive ability, bullying, and long-term relationships.